I was thinking about this today, remembering the playground as a child. I absolutely understood “the merry-go-round.” I believed deep-down that it had been invented for just me. It fit me, very well. I like pushing around and around, and when it started to get beyond me, I would fling myself on to the spinning platform. If I made it, the battle was only half-done. Now, I had not only had to stay on, but I also had to avoid all other kids being spun off. Just getting to your feet was a major undertaking. 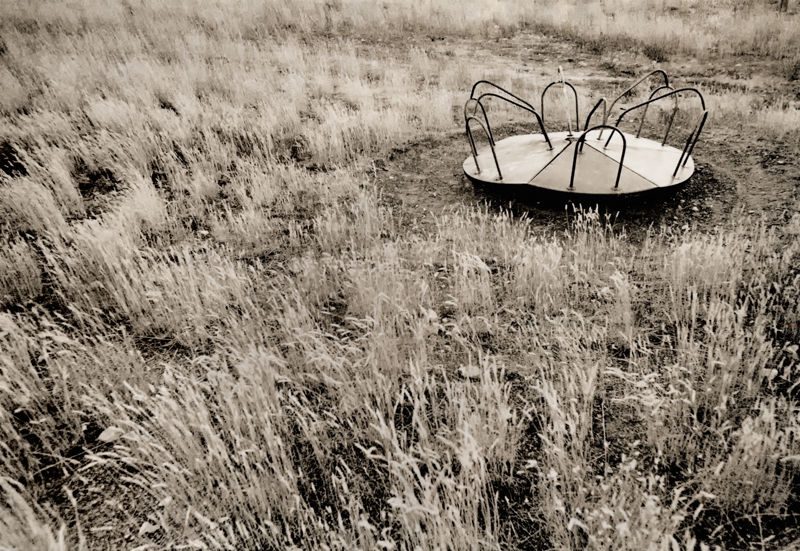 As the centrifugal force began to increase, the faster it went, the greater our momentum, and the more kids were thrown off; they tumbled into the mud. There would be kids strewn all over the place, in heaps, crying. Clothes ripped, and knees bleeding. This wasn’t for ‘the faint of heart.’ This was war! Sometimes, life is a difficult ride. But I know this. If I can make it to the center, everything will be ok. The dynamics of discipleship and mental (or physical) illnesses make it different. We are all trying to find our way. We stumble and fall (even hurled into the mud.) But the center is right were we need to be. It is the center that compels and calls. We were made for this. We must continually fight to be at the center. If you fall off, you can get right back up, and try again. Nothing gets easier. Everyone scrapes their knees. I think one of the reasons that “heaven” is not talked about on every page of the Bible is we all would ‘mutiny,’ and head for its glorious shores. It’s going to be that good. We will struggle. But, we can struggle well with our illnesses if we we know His presence. I get so my edges are frayed, and I feel like everything around me is dissolving. My “fight or flight instinct” kicks in, and I feel frantic trying to hold together. Being mentally ill is like flying a plane that has engine problems. There is no escape; all you want it to cower and hide. But you can’t. There is no place to go, but Jesus. But there is a certain place, and when you battle to get to the center, you will find freedom from the pull of outward things. It is good to rest in Jesus, and abide in the center with him. Spiritually, you have been infused with His presence. And you rise up! You now discover that you have wings. And the ‘merry-go-round’ has served its purpose. This is a bricklayer’s accident report that was printed in the newsletter of the English equivalent of the Workers’ Compensation Board. I am writing in response to your request for additional information in Block #3 of the accident reporting form. I put “Poor Planning” as the cause of my accident. You asked for a fuller explanation and I trust the following details will be sufficient. Securing the rope at ground level, I went up to the roof, swung the barrel out and loaded the bricks into it. Then I went down and untied the rope, holding it tightly to insure a slow descent of the 240 lbs of bricks. You will note on the accident reporting form that my weight is 165 lbs. Due to my surprise at being jerked off the ground so suddenly, I lost my presence of mind and forgot to let go of the rope. Needless to say, I proceeded at a rapid rate up the side of the building. In the vicinity of the third floor, I met the barrel which was now proceeding downward at an equally impressive speed. This explains the fractured skull, minor abrasions and the broken collarbone, as listed in Section 3, accident reporting form. Slowed only slightly, I continued my rapid ascent, not stopping until the fingers of my right hand were two knuckles deep into the pulley which I mentioned in Paragraph 2 of this correspondence. Fortunately by this time I had regained my presence of mind and was able to hold tightly to the rope, in spite of the excruciating pain I was now beginning to experience. At approximately the same time, however, the barrel of bricks hit the ground and the bottom fell out of the barrel. Now devoid of the weight of the bricks, the barrel weighed approximately 50 lbs. I refer you again to my weight. As you might imagine, I began a rapid descent down the side of the building. In the vicinity of the third floor, I met the barrel coming up. This accounts for the two fractured ankles, broken tooth and severe lacerations of my legs and lower body. I am sorry to report, however, as I lay there on the pile of bricks, in pain, unable to move and watching the empty barrel six stories above me, I again lost my composure and presence of mind and let go of the rope. And I lay there watching the empty barrel begin its journey back onto me.